Listen now to Lisen Stromberg's podcast about women in the workplace! This was such a great interview with Lisen Stromberg. 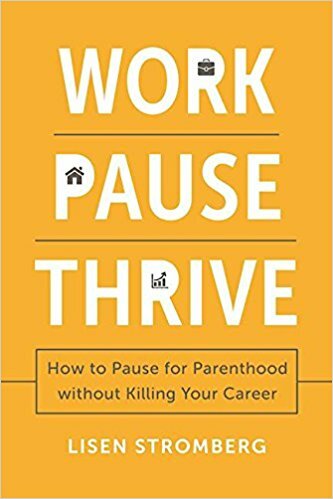 Before our conversation, I read her book for a second time, “Work PAUSE Thrive: How to Pause for Parenthood without Killing Your Career," and I know why it is turning into such a bestseller. It is great! Her book and our podcast will be a real eye-opener for you. How can you, yes you, work, have a family and return to the workforce without slipping, sliding or skipping a beat? Listen now to find out. During our interview, Lisen and I realized that our professional lives have a great deal in common. I managed my career, raised my family and even cared for parents, without a pause. And like Lisen, I managed to thrive. Early on, Lisen learned that it was really hard to pursue a career in advertising and marketing while raising her children. She paused, pivoted and became an award-winning journalist. Along the way, she realized that other working women were struggling with the same choices. Could they pursue a career and have families or was it an either/or that would forever change their career growth and personal lives? Like a true entrepreneur, Lisen determined that maybe it didn’t have to be this way. Maybe it was time, finally, to rethink how to balance home and work in a culture that devalues the care giving roles we all must perform at some stage in our lives. With the growing dependence of parents on their children, typically their daughters, she recognized that the work/family conundrum was quickly demanding a realistic answer, and fast. Huffington Post article by Andi Simon on "Work PAUSE Thrive"
Lee Caraher's book: "The Boomerang Principle"
Lisen's book: "Work PAUSE Thrive"